I meant the book, not the cat, but he insisted on jumping into the photo. I ordered 2 copies of the book. I'll send out the one without the cat hair! We still need to settle in but I don't want to wait any longer to pick 2 contest winners. Ahem, just a minute while I use a random number generator . . .
. . . the winner of Cookie A's new book is Jessica, and the winner of two skeins of Brooks Farm yarn is Tera! Jessica and Tera, I will contact you soon, but if you happen to be reading this, it would be great if you could send me a quick email with your mailing address. Thanks! I appreciate everyone who stopped by and left a comment. It's good to know I'm not the only one who tends to let the WIPs/UFOs accumulate! And it was great fun to read each and every encouraging word. Now I need to go unpack, but I'm sure there will be more contests to come in the near future! I'm Done with the List, and I'm Celebrating with a Contest! I started this blog over a year ago because I enjoy knitting, as well as reading, learning, and writing about knitting. But I also had a goal of becoming a better finisher. In my second post I confessed that I had become one of those knitters with multiple unfinished sweaters tucked away in closets. I included a list of UFOs/WIPs, with a goal of finishing or frogging each one by February 2010. I'm just happy I got through the list. Of course, a lot of other knitting has been going on as well, but these were the items that hibernated for one reason or another. Finally, each and every one is finished or frogged. It has been a great learning experience, and I have some sweaters to wear this winter. I let my 1 year blogiversary roll on by, but I don't want to let this occasion go without celebrating. When I return to announce the winner of today's contest it will be my 100th post, AND I am done with THE LIST! Okay, so maybe it is 9 months later than planned . . .hmmm, 9 months . . . it wasn't quite as hard as giving birth, but it took even longer! All you have to do to be entered to win is leave me a comment by Saturday, November 27th. I will use a random number generator to pick 2 winners. 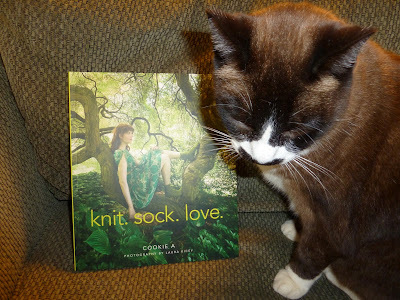 Be sure to include your email address or your Ravelry name when you post your comment so that I can notify the winner. I'll be away from the blog while the contest is going on, so meanwhile, I want to take time to wish my friends and family a Happy Thanksgiving! I still feel exactly the same as last time around, if not even more grateful for all of it.